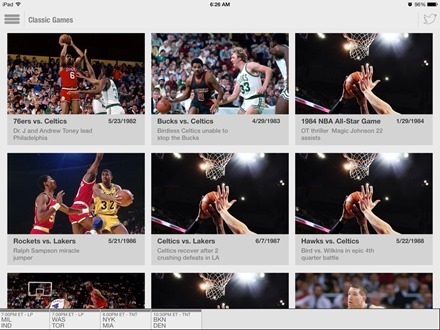 The NBA Game Time for iPad 2013-2014 app was updated again yesterday, adding a superb looking new section titled ‘Classic Games’. The new section, as the name suggests, features videos from some classic NBA games from past decades. There are currently around 20 videos in the section, ranging from one from the 1960s (Celtics vs. Lakers) to a couple from the year 2001. Just looking at some of the players and the moments featured in these is a great walk down NBA Memory Lane. Kareem when he was still Lew Alcindor; Oscar Robertson; an ABA dunk contest; an All-Star game where Magic has over 20 assists, playoff battles; a dominant performance by Charles Barkley, and more. Unfortunately, access to the new section requires that you have an NBA League Pass. I was hopeful that the ‘Mobile’ level League Pass (priced at $27) might be enough to get the feature – but it turns out that will only get you access on an iPhone or Android phone. For the iPad, Android tablets, or a computer you need a ‘Broadband’ League Pass, starting at $65. That seems quite a big premium for the step-up from phone to tablet viewing. Too steep for me, much as I love those old games.